If you look out the windows or pull into the driveway and notice that the pinestraw and mulch around your home is looking kind of dreary, then you are not alone. This is the time of year when things are stuck in winter dormancy, and it is the perfect time to freshen up your mulch or pinestraw. There are three reasons that the winter months, and February in particular, are great for putting down a fresh layer of mulch or pinestraw around the base of trees, in flower beds, and surrounding shrubs and bushes. When driving through neighborhoods or even the downtown areas of Atlanta, it is easy to spot a fresh pinestraw or mulch installation. Everything looks fresher, brighter, and cleaner. Get rid of your winter dreariness with a fresh layer. Pinestraw and mulch help support water retention. Many trees, bushes, and shrubs are thirsty after the winter. Even with rainy days, it is hard for trees to get enough water through the winter. Fresh pinestraw and mulch act as a barrier and hold the water longer so that the tree roots can properly absorb the water. A fresh layer of mulch or pinestraw act as a natural weed inhibitor. This fresh layer will help reduce the amount of springs weeds popping up in March and April and ultimately keep your flower beds looking healthier and more attractive. 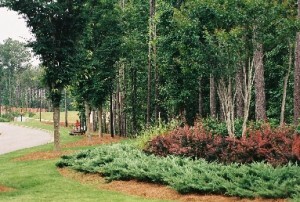 Hutcheson offers long needle pinestraw and freshly dyed mulch in black or brown. Our design team can offer helpful suggestions in choosing the right look for your needs. The Hutcheson Horticultural install team is able to easily install your fresh mulch or pinestraw in no time at all. Call us at 770-924-1001 for our February special of $6/bale of installed pinestraw (50 bales or more) or schedule an appointment online.